Your kitchen is one of the spaces in your home that receives the most foot traffic. It is also one of the most remodeled rooms in the house when homeowners are looking to sell their property, because the project gives a good return on investment. Whether you’re designing a new home or remodeling, it is important to consider a kitchen windows design that will increase the value of your home both economically and aesthetically. 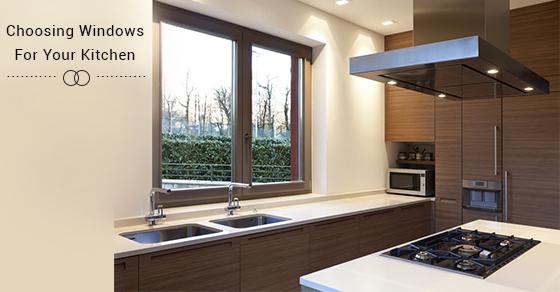 Most kitchen windows are placed above the sinks or counters where they are hard to reach and disposed to moisture. You should consider choosing a style that is much easier to open and close, like a sliding, casement, or awning. Awning windows can be easily pushed out to open or pulled in to close, making them the ideal choice, especially for hot kitchens. They are best placed above eye-level or close to the ceiling, so hot air rising from the stove or oven can escape easily. Casement and sliding windows use a crank out method to open and close, which is well suited for hard to reach areas, like behind the kitchen sink or above the counters. If you are making major renovations to your kitchen, you should ensure that the replacement windows complement the entire kitchen design. If you prefer a varied style of decorating, it is important that you chose style elements that do not viciously clash with one another. The typical placement of kitchen windows, above sinks and counters, makes them prone to moisture and staining. You should be careful when choosing kitchen window frames and opt for easy to clean materials like fiberglass or vinyl. Fiberglass is a great material because it is energy efficient, can withstand extreme temperatures, heat and cold, and has the aesthetic appeal of painted wood. Vinyl is also easy to care for, and can maintain its good look for long without requiring staining or painting. If you prefer to use wood, perhaps to match your kitchen’s décor, choose a finish that can hold up well against moisture and stains, and do proper maintenance. Kitchen window costs are different depending on the style and materials chosen, so your decisions could be influenced by your budget. Whether you opt for a modern, rustic, or traditional kitchen look, you should ensure that your windows match your style, in terms of sizes, styles, colors, and materials.